In the opening match of the 2018/2019 UEFA Europa League tournament phase, Olympiacos host Real Betis at the Karaiskakis Stadium in Piraeus, a game which will be crucial to the outcome of Group F. AGONAsport analyses the Spaniards in detail. Watch LIVE from AGONAsport: Olympiacos - Real Betis, UEFA Europa League matchday 1 on Thursday September 20th. Details here. Although they aren’t regarded as a leading Spanish club, Real Betis have won La Liga on one occasion, tasting glory in the competition in 1935. Alongside that triumph, the Seville based club also claimed two Copa del Reys, but their last trophy at the highest level came in 2005 and after a difficult period which resulted in relegation, Real Betis returned to La Liga in 2015. In their entire history, Betis have actually only participated in 57 European matches, notably competing in the 2005/2006 UEFA Champions League group stage. Their most recent continental campaign came in the 2013/2014 season when Betis were knocked out at the Last 16 phase of the Europa League by arch-rivals Sevilla. Last season, Real Betis enjoyed somewhat of a renaissance, surprising many by finishing in an impressive sixth place with 60 points and qualifying for the prestigious Europa League group phase where they will take on Olympiacos, AC Milan and minnows Dudelange. The two battles against Olympiacos are expected to decide the fate of second place behind Italian giants Milan. 59-year old Quique Setien, who previously managed Racing Santander, Poli Ejido, Equatorial Guinea, Logrones, Lugo and Las Palmas, took charge of Betis in May 2017 and steered the club to the bright lights of the UEFA Europa League in his debut season. In his playing days, Setien had huge success with hometown club Santander, making over 300 appearances for the team and also representing the Spanish national team three times. His excellent first campaign with Betis has raised his profile in Spain and he’s hoping to achieve positive results in Europe. Remember tricky Spanish winger Joaquin? The former international star is now in the twilight zone of his career at 37 years of age, but he’s a key member of the Betis team and wears the captain’s armband. In his prime, Joaquin shone for Valencia, Malaga, Fiorentina and the Spanish national team, displaying fantastic ball control and skills on the flanks. In 2015, Joaquin returned to boyhood club Betis and is under contract until 2020. Experienced Mexican attacking midfielder Andres Guardado pulls the strings and will look to find holes in the Olympiacos defence. With Mexico’s national team, 31-year old Guardado has played at various FIFA World Cups, and it’s no easy task to rob him of possession. His eight assists in the 2017/2018 La Liga show exactly where his strengths lie. 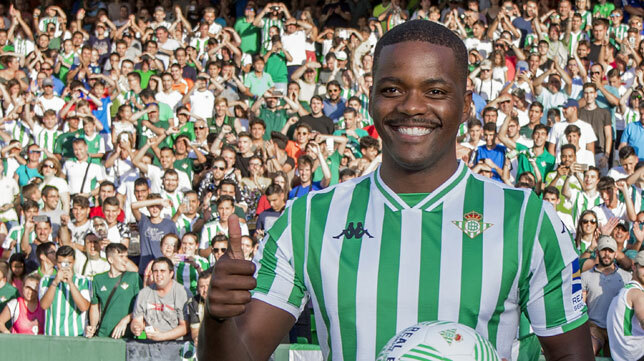 After the scandal involving a fan attack at Sporting Lisbon, talented Portuguese defensive midfielder William Carvalho opted to leave the club and transfer to Spain, penning a five-year deal with Real Betis. Highly regarded across Europe, Carvalho rarely puts a foot wrong in front of the defence, preventing the opposing team from exposing the back line. Carvalho and current Olympiacos winger Daniel Podence were teammates at Sporting. In the maiden game of the new La Liga season, Betis suffered a humbling 0:3 home defeat at the hands of Levante, but they’ve since picked up and beat Sevilla 1:0 in the Seville derby. Betis have also drawn 0:0 with both Alaves and Valencia to occupy 10th place of the standings with five points. Interestingly, this will be the first time when Betis have met Greek opposition, having never played an Hellenic team in their previous European adventures. For their part, Olympiacos took on Barcelona in the 2017/2018 UEFA Champions League group stage, dropping a 1:3 defeat at the Camp Nou but heroically holding on to a 0:0 draw in Piraeus. Looking back in the past, the Thrylos have played Spanish clubs on a regular basis on competitive games, often picking up decent results at home while struggling in Spain.